Factory Sealed 2018 Panini Playbook Football Hobby Box mit 1 Pack Per Box, 4 Cards Per Pack. In jeder Box: 4 Autogramme oder Memorabilia Cards, davon 1 Booklet ! 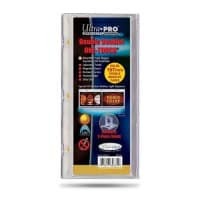 Produktinformationen "2018 Panini Playbook Football Hobby Box NFL"
ROOKIE PLAYBOOK JERSEY AUTOGRAPHS NFL SHIELD: Rookie Playbook Jersey Autographs return after a one year hiatus, with on-card ink! VAULT TRI FOLD JERSEY AUTO PREMIUM: Playbook football delivers power packed tri-fold cards, printed on acetate! Look for a vault of patch content with 8 jersey swatches and an autograph in Vault! PLAYBOOK MATERIAL AUTOGRAPHS RED: Find a star-studded lineup in Playbook Material Autographs: Tom Brady, Aaron Rodgers, Russell Wilson, Rob Gronkowski, Brian Dawkins, Peyton Manning, Ray Lewis and more! ROOKIE JUMBO MEMORABILIA BOOKLET COMPLETE LOGO: Oversized jersey booklets with full team logo parallels! Find the top 40 rookies in Rookie Jumbo Memorabilia Booklet! ROOKIE SIGNATURES PLATINUM: n addition to Rookie Playbooks, look for the newest NFL talent represented in Rookie Signatures. Find the parallels exclusive to hobby! GAME OF INCHES GOLD: Game of Inches returns to Playbook in stunning acetate fashion! Find some of the most dynamic photography driven booklets in the hobby! FRONT 4 SIGNATURES BOOKLET PRIME: Front 4 Signatures combines jerseys, autographs and some of the games' strongest four-player combos! HAIL MARY SIGNATURES PRIME: Find the leagues' elite play callers in Hail Mary Signatures! 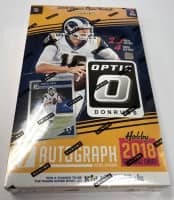 Find the likes of Tom Brady, Aaron Rodgers, Derek Carr, Carson Wentz, Ben Roethlisberger, Philip Rivers, Jared Goff, Deshaun Watson, Patrick Mahomes and more! NEXUS TRI FOLD JUMBO JERSEYS GOLD: Nexus connects your team's favorite trio with jumbo patches in a three-card booklet! 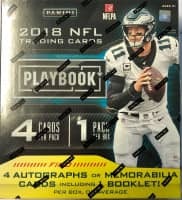 Weiterführende Links zu "2018 Panini Playbook Football Hobby Box NFL"
Fanbewertungen für "2018 Panini Playbook Football Hobby Box NFL"